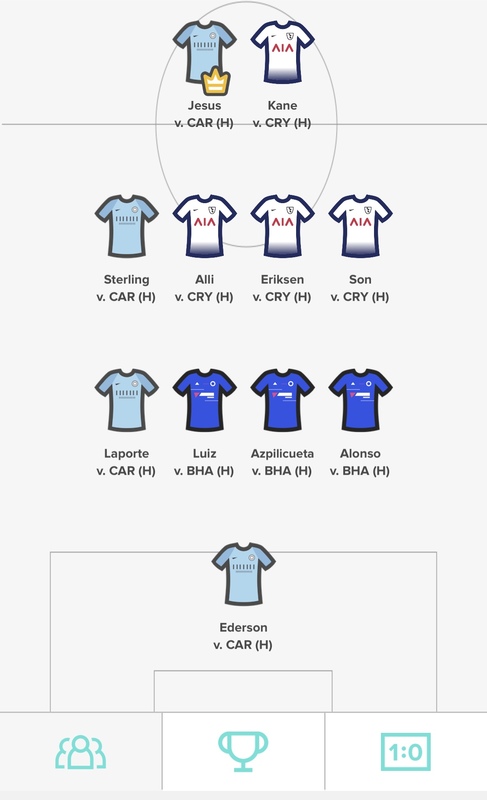 Starting 11 have launched a brand new feature for the Gameweek 32 midweek fixtures. Will Aguero or Jesus lead the line? As the position classification becomes the same as Fantasy Premier League, all of your Gameweek 32 Free Hit research can be implemented into the daily game. 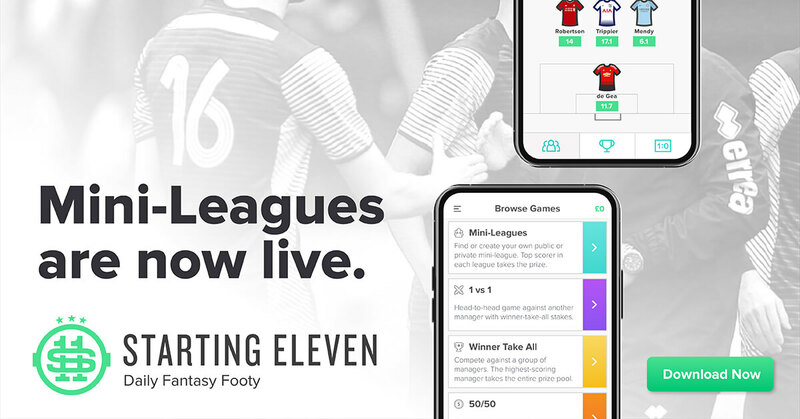 The Starting 11 team have listened to your feedback and have now implemented identical player positioning to Fantasy Premier League. That means the likes of Salah, Sterling and Hazard have now been reclassified as midfielders, meaning lineups are even more attacking than before. Plus, remember that Starting 11 has no budget constraints, so it’s possible to have a midfield of Salah, Sterling, Hazard, Mane plus a front 3 of Kane, Aguero and Aubameyang! So, who should you select for the bumper round of Double Gameweek 32 fixtures on Wednesday? There’s 3 fixtures to select from! Manchester City are unbeaten in their last 7 Premier League games. They’ve scored 7 goals in their last 4 games, conceding just 1. Another clean sheet looks to be a formality in Gameweek 32 and there will be plenty of goal scoring opportunities against a Cardiff defence who are struggling. 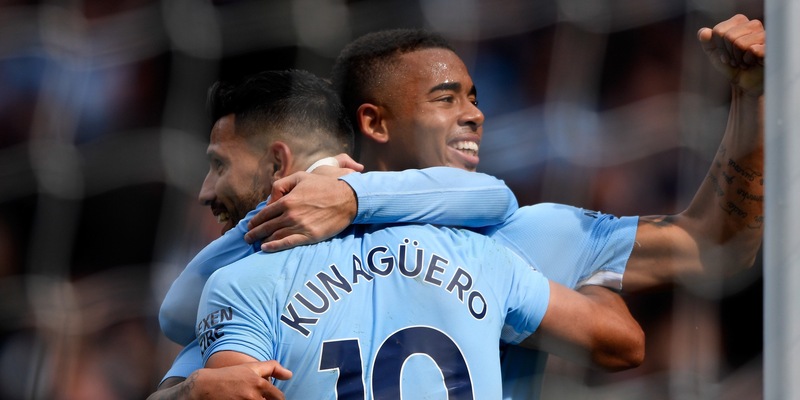 Given that Sergio Aguero is flagged with an injury, its Gabriel Jesus and Raheem Sterling who are relied upon from an attacking perspective. They have the best points potential from the City forwards: Sterling got a hat trick in his last home fixture and Jesus will be looking to put a stamp on the central striker role in Aguero’s absence. Laporte is given the defensive selection: he was involved when City kept a clean sheet in the reverse fixture. He has 2 goals and 1 assist to his name this season. It’s now 15 clean sheets for Ederson, as he hunts down the Golden Glove: he has an assist this season, and 5 clean sheets in his last 6! Spurs assets are expected to be in the goals for their first fixture at the new stadium. It’s likely to be an explosive affair on Wednesday evening, after a long wait for their fans. Harry Kane is a reliable performer on the big occasions and will be motivated to feature on the score sheet in this monumental fixture: he has 2 goals in his last 4 games, with penalty duties too. Son and Alli will also be vying for the status of first scorer in the new stadium: they’ll have to step up their recent form. Eriksen should provide the creativity, with an assist last time out. Chelsea have kept 12 clean sheets this season, including 1 in their last 4 games and in Double Gameweek 32 they face Brighton who have one of the worst goal scoring tallies in the entire Premier League. Kepa has reclaimed his place between the sticks: he has made 67 saves this season on his way to 12 clean sheets. Luiz, Alonso and Azpilicueta have provided the most attacking output in recent weeks. Azpilicueta has linked well to asssist 3 Higuain goals, as well as scoring himself and Luiz has 2 goals and 2 assists for the season. Alonso could be back in favour after providing an assist at the weekend. Starting 11 have contests available on Tuesday and Wednesday. Here’s the Gameweek 32 daily team we will be lining up with on Wednesday.